N35M was issued a standard airworthiness certificate on April 7, 1970 after a 2 hour production test flight. 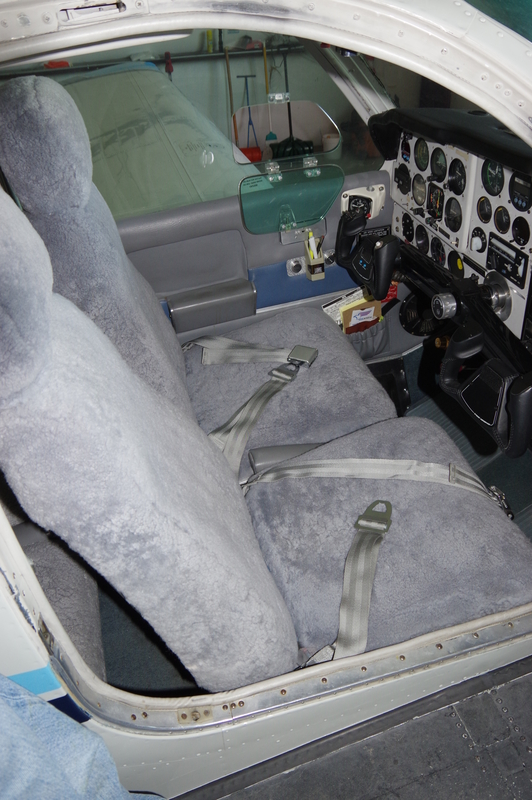 This Bonanza has had the same owner since the mid-1980's and has been maintained for years by a local Beechcraft specialist. The 550 conversion makes this one of the faster later model Bonanzas around, capable of running lean-of-peak (for those motivated to do so) for great cruise speeds and longer engine life (done properly) as well as incredibly economical fuel flow. A 520 powered Bonanza will run 168 knots true at 13 gph lean of peak! The original plane was base white with Champagne Gold and Jade Mist accents, the N Number N4382A, and Mist Green interior paint. 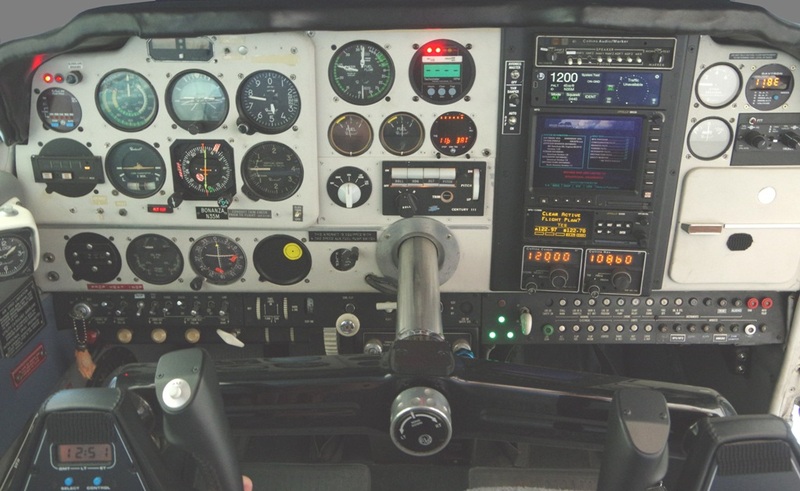 This Bonanza has a good history of mods through the years to keep this V35B up to date. The original McCauley 2A36C23 two-blade prop was replaced at 146 hours total time and replaced witha McCauley 3A32C76 three blade prop. The original IO-520BA powerplant was replaced by a factory remanufactured IO-550-B installed on the Beryl D'Shannon STC SA2200SW on 7/19/1989. Other mods include GAMI injectors, Beryl D'Shannon glass with frameless pilot's vent window, Beryl D'Shannon air-oil separator, Chemtron built-in oxygen, Whelen strobes, and many others. The N-number was changed to N35M when Murmer stripped and re-painted the plane in 1991. Paint was done with base Jet Glow Graystone with Midnight Blue and Lite Blue Acry Glow accents. 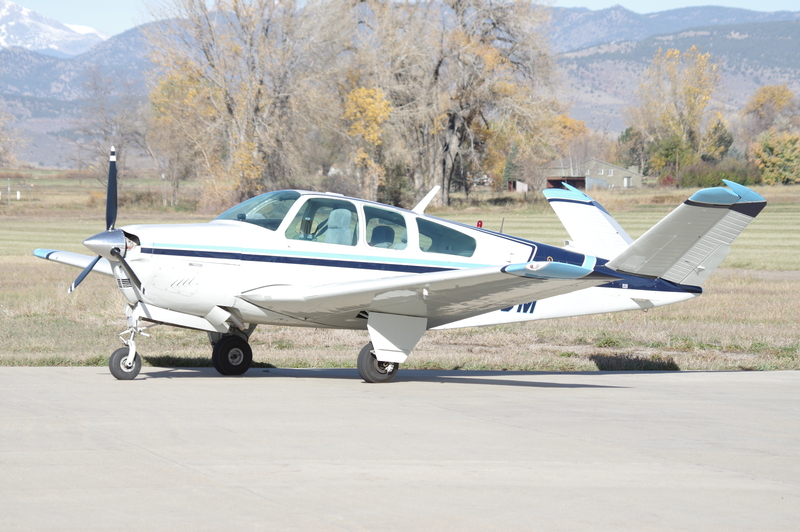 This Bonanza based at the Longmont Vance Brand Airport and can be seen by appointment. Insurance endorsed transition training and delivery are available. Please don't hesistate to inquire with regard to tailoring this plane to your needs (modifications, cosmetics, or avionics), or to discuss financing options. 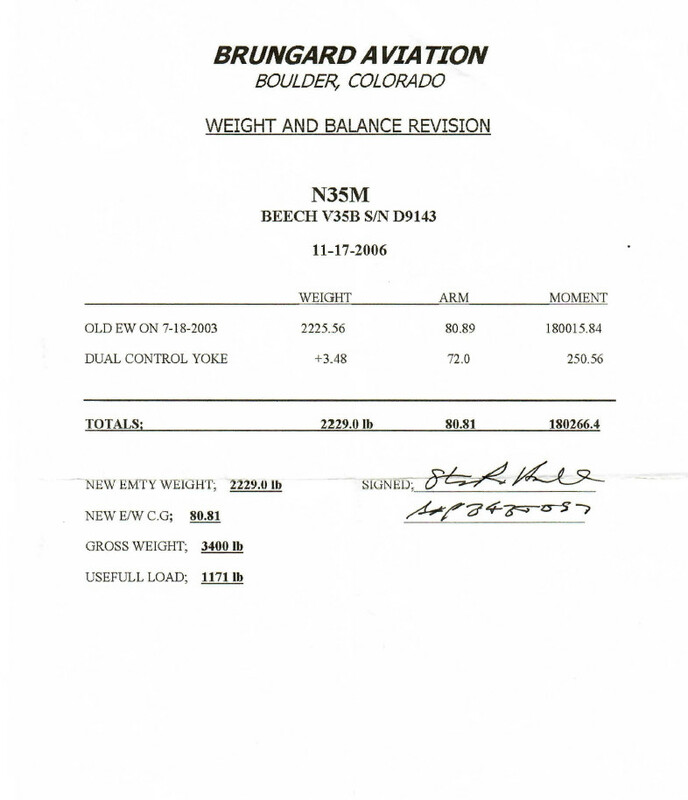 Current weight and balance data (includes aft mounted Oxygen bottle): 2229 lb at 80.81" with useful load of 1171 lb. Paint was done in 1992 by Murmer and is in very good condition. There are a few leading edge nicks and one area of missing paint about the size of a silver dollar on the right wing leading edge. Paint is glossy and shows like a plane that has been hangared since paint. Ruddervators were done in 2001, and the paint was matched well. 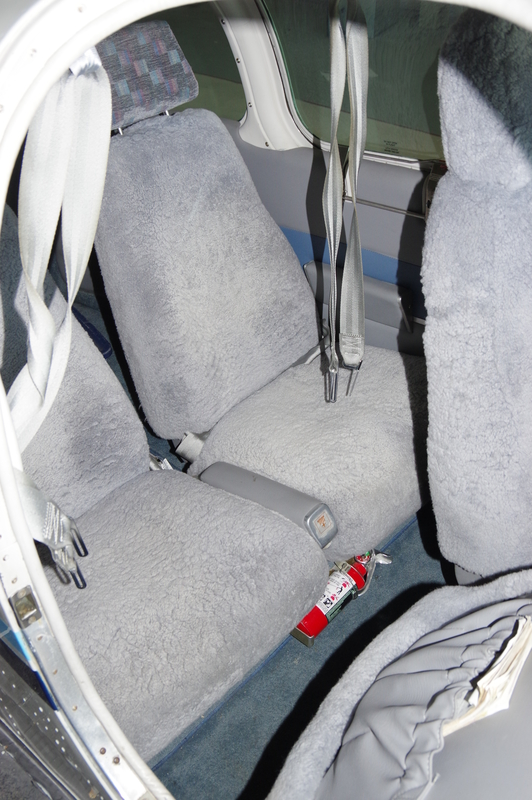 Interior is original with sheepskin seat covers in grey. All specifications are believed to be accurate but subject to verification.